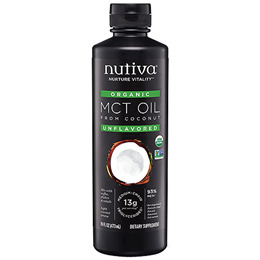 Nutiva Organic MCT Oil is an oil concentrated with the Medium-chain triglyerides, capric acid and caprylic acid. Medium-chain triglycerides, or MCTs, are the types of saturated fatty acids typically found in coconuts. Made from certified organic coconuts grown without pesticides or hexane. Paleo-friendly and naturally gluten-free. MCTs are easily digested and provide energy, support metabolism and fuel. Take 1 tablespoon 1-3 times daily as a dietary supplement. Add to coffee, shakes, yogurt and salads. Not recommended for use in frying. Below are reviews of Nutiva Organic MCT Oil 93% - Unflavoured - 473ml by bodykind customers. If you have tried this product we'd love to hear what you think so please leave a review.